Pink Lemon Twist: October Frost Back - Finished! 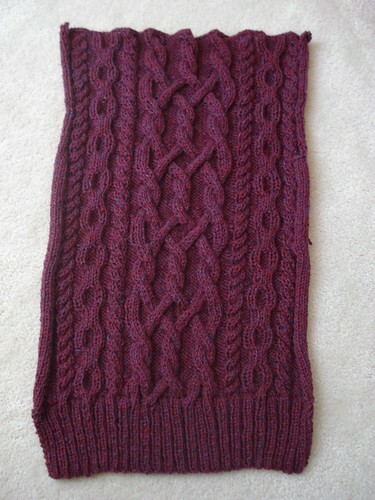 In a monumental fit of knitting on Saturday, I finished the back of October Frost. It was bound off before Phelps took his 8th medal (Woo Hoo!) and now it's blocking along with the fronts. I love the cables in this design, the way they all fit together and twist over the surface of the pieces. It looks like I will only need 7 skeins of the Peace Fleece to finish this cardi (the yardage called for 8 for the smallest size) but I don't mind having a spare skein - maybe I'll make some heavy duty dog walking mitts. Once it's blocked I will sew it all together and add the front bands and collar. Then I'll wash it once more (to get the yarn to bloom and soften on the bands and collar), sew on buttons, and it's ready for a crisp Fall day! Absolutely beautiful cables. What a wonderful way to welcome fall! I find myself wishing for cooler weather. Am I crazy? October Frost looks great! It's going to be my big project for this winter, starting with spinning LOTS of 3 ply BFL.